We’ve all seen the Buzzfeed lists and the videos on Facebook of those crazy-looking breakfasts, that are all coincidentally found in Sydney, Australia. So when I had the chance to spend 6 months in Sydney, I knew immediately where and what I wanted to eat. One difference I found between Australian and American culture is that breakfast is actually a surprisingly social meal. Cafés would open at 6 or 7 a.m. and it would hardly be surprising to see lines of customers, waiting for a table or for a coffee. Catching up with someone was best done over an early morning breakfast during the week, not a weekend brunch. And like how America has a plethora of diners, Australia has cafes. Instead of chain coffee shops, like Starbucks or Dunkin Donuts, coffee shops are small, local, and independently owned, and each café usually has a small, unique menu. Cafés were a breakfast, lunch, and sometimes dinner establishment, but I found breakfast had the most exciting dishes. For example, at Speedo’s Café, right by Bondi Beach, I got this amazing coconut French toast, which sounds delicious in it of itself, but the presentation gave it such a wow factor—the edible flowers, the figs, and the strawberries. It’s amazing how a typical breakfast dish, like French toast, can really be elevated to this level. It was not like a random assortment of ingredients were just put on the plate; each component worked so well together and it came together perfectly as a dish. Smoothies and smoothie bowls were also really popular. But of course these cafés don't just throw some granola on a smoothie in a bowl and call it a day. Instead, they want to make the dish uniquely theirs. 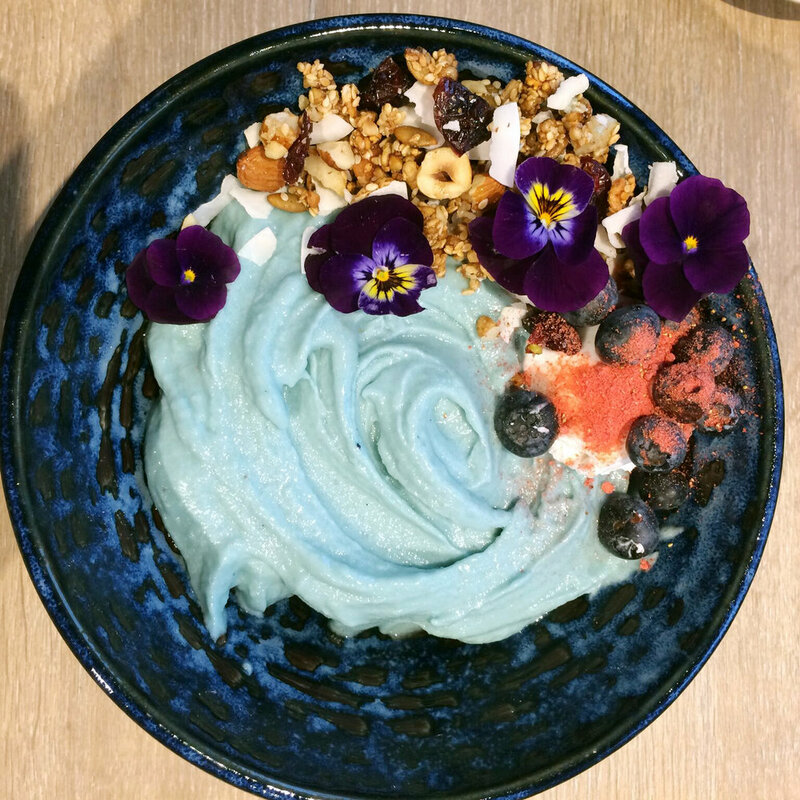 Concrete Jungle, which was a two minute walk from where I stayed in Sydney, made their version of a smoothie bowl blue. The blue color comes from some special algae, but it tasted like a regular banana pineapple smoothie. Presentation, once again, was gorgeous, and it was an extremely elegant smoothie bowl—two things I never really ever grouped together before this. Another thing that I really loved about this whole café culture was that the cafes were local, as in mostly people who lived in or around that neighborhood went. But when I heard about these waffles, I absolutely wanted to go, so I ended up taking the train in the middle of the day to this very quiet suburb. The waffles were 100 percent worth it, though. Apart from being some of the best Belgian waffles I’ve ever had, it had so many layers that worked individually and together. The cotton candy-looking clump on the top was actually pashmak, a Persian cotton candy. Visually, it looks the same as cotton candy you might find as a circus or fair, but it was texturally much denser and tasted like pistachios. It was so fun to try something new with something I’ve eaten dozens of times before. Overall, every café I had the chance to go to had its own amazingly extra breakfast, and I really wish it was more common in the U.S.! If you ever have a chance to go to Sydney, or anywhere in Australia, 100 percent go, especially if you love the over-the-top and extra factor.